Rotherham glass packaging manufacturer Beatson Clark has found another niche for its products - cocktails. The Greasborough Road firm, which has been making glass bottles and jars in Rotherham since 1751, specialises in providing glass packaging solutions for niche brands in the food, drink and pharmaceutical markets worldwide. It is well know for manufacturing bottles for breweries including Robinson's, Meantime, Bedlam and Brooklyn Brewery in New York. Now Beatson Clark is capitalising on the mixology trend by providing a 300ml food jar for a range of ready-to-serve premium cocktails. London Rd Jam Jar Cocktails is a range of authentic flavours, including Mojito, Cosmo and Singapore Sling. Each recipe has been developed by expert mixologists with a spin on the classics and packaged in Beatson Clark recyclable jam jars featuring label designs bespoke to each flavour. 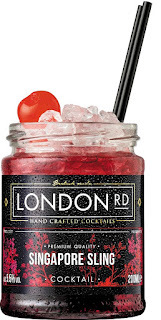 London Rd Jam Jar Cocktails have been launched by Global Brands, the UK’s leading independent drinks business, and are proving popular with consumers who enjoy the taste of an authentic cocktail at home as well as bar operators experiencing operational time constraints. Charlotte Taylor, marketing manager at Beatson Clark, said: "Our partnership with Global Brands exemplifies the flexibility of our approach. We have an extensive and versatile range of shapes and sizes available from stock, and while our 300ml food jar was designed primarily for jams and chutneys its simplicity and sleek lines work perfectly with the contemporary look of these stylish cocktails! "We had the cocktail jars on display at Food & Drink Expo last month and they proved very popular with visitors to our stand. Serving cocktails in jars is a huge trend at the moment and we were very pleased to be able to help Global Brands with their innovative and creative product idea." Catherine Roddis, purchasing manager at Global Brands, added: "When choosing a jar supplier for this innovative new product, I immediately thought of Beatson Clark as I knew I could rely on their excellent customer service and professionalism. "Having used Beatson Clark for a number of years to supply other products in our portfolio I was confident the quality and clarity of the glass would be excellent. The company have been accommodating and helpful in going the extra mile to meet our increasing demand as well as being competitively priced." Beatson Clark recently won the design award at the Glass Focus 2016 Awards, part of the annual British Glass Conference, for its bespoke bottle design for STORY Drinks range of fruit pressés.